Preah Khan Temple, sometimes transliterated as Prah Khan, is a temple at Angkor, Cambodia, built in the 12th century for King Jayavarman VII. It is located northeast of Angkor Thom and just west of the Jayatataka baray, with which it was associated. It was the centre of a substantial organisation, with almost 100,000 officials and servants. The temple is flat in design, with a basic plan of successive rectangular galleries around a Buddhist sanctuary complicated by Hindu satellite temples and numerous later additions. Like the nearby Ta Prohm, Preah Khan has been left largely unrestored, with numerous trees and other vegetation growing among the ruins. 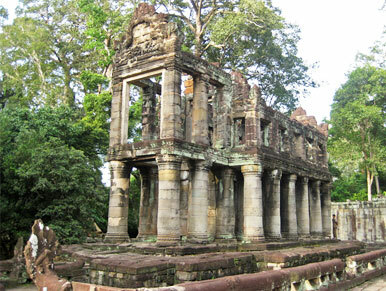 Preah Khan is a huge, highly explorable monastic complex. Full of carvings, passages and photo opportunities. It originally served as a Buddhist monastery and school, engaging over 1000 monks. For a short period it was also the residence of King Jayavarman VII during the reconstruction of his permanent home in Angkor Thom. Preah Khan means ‘sacred sword.’ In harmony with the architecturally similar Ta Prohm, which was dedicated to Jayavarman VII’s mother, Preah Khan is dedicated to his father. Features of note: like most of Jayavarman VII’s monuments, the Buddha images were vandalized in the later Hindu resurgence. Some Buddha carvings in the central corridor have been crudely carved over with Bodhisattvas, and in a couple of odd cases, a lotus flower and a linga. Also note the cylindrical columns on the building west of the main temple. It is one of the only examples of round columns and may be from a later period. 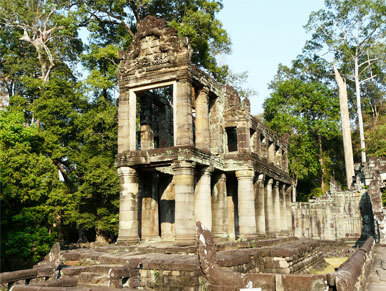 Preah Khan was built on the site of Jayavarman VII’s victory over the invading Chams in 1191. Unusually the modern name, meaning “holy sword”, is derived from the meaning of the original—Nagara Jayasri (holy city of victory). The site may previously have been occupied by the royal palaces of Yasovarman II and Tribhuvanadityavarman. The temple’s foundation stela has provided considerable information about the history and administration of the site: the main image, of the bodhisattva Avalokiteśvara in the form of the king’s father, was dedicated in 1191 (the king’s mother had earlier been commemorated in the same way at Ta Prohm). 430 other deities also had shrines on the site, each of which received an allotment of food, clothing, perfume and even mosquito nets; the temple’s wealth included gold, silver, gems, 112,300 pearls and a cow with gilded horns. The institution combined the roles of city, temple and Buddhist university: there were 97,840 attendants and servants, including 1000 dancers and 1000 teachers. The temple was previously overrun with a particularly voracious vegetation and quite ruined, presenting only chaos. Clearing works were undertaken with a constant respect for the large trees which give the composition a pleasing presentation without constituting any immediate danger. At the same time, some partial anastylosis has revived various buildings found in a sufficient state of preservation and presenting some special interest in their architecture or decoration. Since 1991, the site has been maintained by the World Monuments Fund. It has continued the cautious approach to restoration, believing that to go further would involve too much guesswork, and prefers to respect the ruined nature of the temple. One of its former employees has said, “We’re basically running a glorified maintenance program. We’re not prepared to falsify history”. It has therefore limited itself primarily to stabilisation work on the fourth eastern gopura, the House of Fire and the Hall of Dancers. The outer wall of Preah Khan is of laterite, and bears 72 garudas holding nagas, at 50 m intervals. Surrounded by a moat, it measures 800 by 700 m and encloses an area of 56 hectares (138 acres). To the east of Preah Khan is a landing stage on the edge of the Jayatataka baray, now dry, which measured 3.5 by 0.9 km (1 mi). This also allowed access to the temple of Neak Pean in the centre of the baray. As usual Preah Khan is oriented toward the east, so this was the main entrance, but there are others at each of the cardinal points. 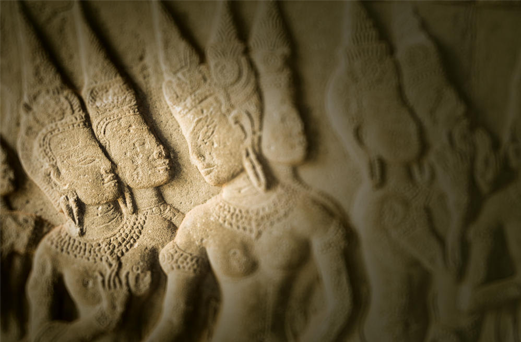 Each entrance has a causeway over the moat with nāga-carrying devas and asuras similar to those at Angkor Thom; Glaize considered this an indication that the city element of Preah Khan was more significant than those of Ta Prohm or Banteay Kdei. Halfway along the path leading to the third enclosure, on the north side, is a House of Fire (or Dharmasala) similar to Ta Prohm’s. The remainder of the fourth enclosure, now forested, was originally occupied by the city; as this was built of perishable materials it has not survived. The third enclosure wall is 200 by 175 m. In front of the third gopura is a cruciform terrace. The gopura itself is on a large scale, with three towers in the centre and two flanking pavilions. Between the southern two towers were two celebrated silk-cotton trees, of which Glaize wrote, “resting on the vault itself of the gallery, [they] frame its openings and brace the stones in substitute for pillars in a caprice of nature that is as fantastic as it is perilous.” One of the trees is now dead, although the roots have been left in place. The trees may need to be removed to prevent their damaging the structure. On the far side of the temple, the third western gopura has pediments of a chess game and the Battle of Lanka, and two guardian dvarapalas to the west. The purpose of this two-storeyed building with round columns is unknown. 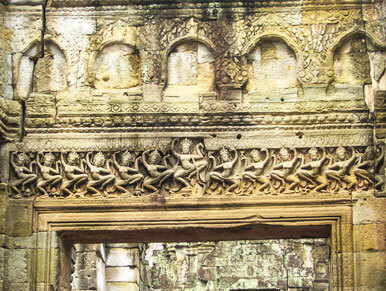 West of the third eastern gopura, on the main axis is a Hall of Dancers. The walls are decorated with apsaras; Buddha images in niches above them were destroyed in the anti-Buddhist reaction under Jayavarman VIII. North of the Hall of Dancers is a two-storeyed structure with round columns. No other examples of this form survive at Angkor, although there are traces of similar buildings at Ta Prohm and Banteay Kdei. Freeman and Jacques speculate that this may have been a granary. Occupying the rest of the third enclosure are ponds (now dry) in each corner, and satellite temples to the north, south and west. While the main temple was Buddhist, these three are dedicated to Shiva, previous kings and queens, and Vishnu respectively. They are notable chiefly for their pediments: on the northern temple, Vishnu reclining to the west and the Hindu trinity of Vishnu, Shiva and Brahma to the east; on the western temple, Krishna raising Mount Govardhana to the west. Connecting the Hall of Dancers and the wall of the second enclosure is a courtyard containing two libraries. The second eastern gopura projects into this courtyard; it is one of the few Angkorian gopuras with significant internal decoration, with garudas on the corners of the cornices. Buddha images on the columns were changed into hermits under Jayavarman VIII. Between the second enclosure wall (85 by 76 m) and the first enclosure wall (62 by 55 m) on the eastern side is a row of later additions which impede access and hide some of the original decoration. The first enclosure is, as Glaize said, similarly, “choked with more or less ruined buildings”. The enclosure is divided into four parts by a cruciform gallery, each part almost filled by these later irregular additions. The walls of this gallery, and the interior of the central sanctuary, are covered with holes for the fixing of bronze plates which would originally have covered them and the outside of the sanctuary—1500 tonnes was used to decorate the whole temple. At the centre of the temple, in place of the original statue of Lokesvara, is a stupa built several centuries after the temple’s initial construction.